A commanding figure steps forward and grand rhetoric flows forth over the object of his or her desire, the audience who may or may not endow the speaker with their sovereignty. This scene has played out repeatedly from ancient times to the present. Throughout history, carefully chosen words, spoken with force or nuance, depending upon the situation, have often seized the day, elevated a leader to mythic status and defined a moment in time. Pericles stood before the Athenians and proclaimed, “let Athens be an education to Greece,” expressing the spirit of a golden age of artistic and cultural achievement. 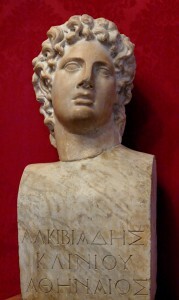 Alcibiades’ sweet words led those same proud Athenians to humiliating defeat when he convinced them to invade Sicily. 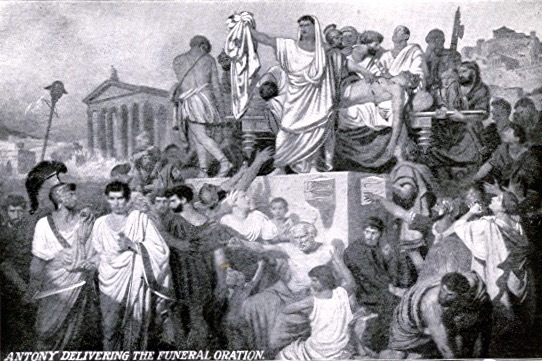 Cato’s riveting speeches before the Roman Senate fired their decision to destroy Carthage while Cicero’s sweeping orations against the rise of empire contributed to his eventual execution. Rhetoric can empower or vanquish its practitioners. Civilization, art, and culture have flourished with fine words. Cities, nations, and empires have also been vanquished by words. The medium for delivering rhetoric may have changed through time, but the finely-honed talent for using words has stayed the same. A quick mind and a facile tongue have always been the leader’s greatest assets. Some things never change. During this contentious election year, rhetoric has been central to the rise and fall of U.S. presidential candidates. Sometimes the words are lofty, oftentimes they have been vulgar, offensive, and divisive. It is all rhetoric, although not always fine rhetoric in the classical manner of the ancient Greeks and Romans. We are, however, still the heirs of that tradition. In a democracy, the ability to persuade a voting population is the road to power itself. Throughout history, carefully chosen words, spoken with force or nuance, depending upon the situation, have often seized the day, elevated a leader to mythic status and defined a moment in time. Mr. Trump has become known for a rhetoric of bombast and controversy, Secretary Clinton plays the experienced statesperson, Senator Sanders the independent progressive. Each has sought to win the minds and hearts of the people. In doing so, they are judged not only by their policies or platforms, but on their manner, gestures, style, and speech. They are all dependent on their rhetoric, now played in a 24-hour news cycle and on all forms of social media. Their words are instantly transmitted, reinterpreted, and twisted to support any and all political, social, and cultural viewpoints. The candidates and their advisors hope to frame messages, repeated constantly, that will change perceptions, build political coalitions, and inspire the nation. The many faces of rhetoric in our own day became clear in a recent NPR story (June 17, 2016) entitled, “8th-Grader Uses Graduation Speech To Impersonate Politicians.” During his oration at Thompson Middle School, near Chicago, Jack Aiello mimicked President Obama, Hillary Clinton, Bernie Sanders, Donald Trump and Ted Cruz. He delivered a perfect impression of each political figure in both speech and gesture, a classic example of rhetoric at its finest. The young man captured his audience’s attention, used words sparingly but effectively, and inferred even more than he said. He took the phrases, mannerisms, and tone of the President and the presidential candidates and without praising or condemning them, shone a clear light on their rhetorical styles. In this lighthearted way, Jack Aiello reminded me of one of the more profound of all political speeches, “Mark Antony’s Funeral Oration” by William Shakespeare in Julius Caesar. In the opening lines, Mark Antony states, “Friends, Romans, Countrymen, lend me your ears; I come to bury Caesar, not to praise him.” The oration does indeed become a celebration and praise for Caesar’s fine personal attributes and his importance to his city and country. An 8th grade American student in 2016 parodies political hopefuls, a 16th century English playwright crafts words that have transcended time and place to mythologize a leader and their place in history. Each understands the strange power of twisting tongues, of the role of words or inspire, mock, or praise. Speech is eternal. Images are universal. Rhetoric is not a word used often today. It is not a generally acknowledged art form, yet, the use of words in the art of persuasion still fills the air.